Cryo Hops from YCH are here! YCH Hops has developed these new LupuLN2 cryo hops through an innovative and proprietary cryogenic process of separating out the lupulin glands of whole hop cones in a nitrogen-rich environment, concentrating the lupulin glands and eliminating chances of oxidation. The result is Cryo LupuLN2 hop pellets, which are concentrated resins and aromatic compounds that give superior flavor and aroma! A concentration of Amarillo resin and aromatic compounds in a convenient hop pellet form! Gives you a ton of hop flavor and aroma without the plant material and associated astringency! Twice the resin content of traditional hop pellets - use at half the rate! A concentration of Cascade resin and aromatic compounds in a convient hop pellet form! A concentration of Centennial resin and aromatic compounds in a convenient hop pellet form! 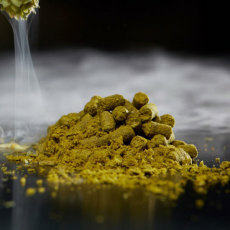 A concentration of Ekuanot resin and aromatic compounds in a convient hop pellet form! A concentration of Mosaic resin and aromatic compounds in a convient hop pellet form! A concentration of Simcoe resin and aromatic compounds in a convient hop pellet form! A concentration of Citra resin and aromatic compounds in a convient hop pellet form!